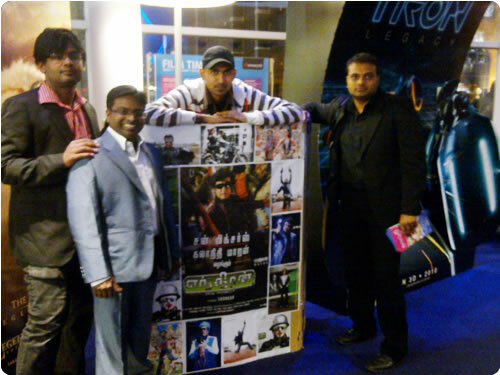 There is a huge South Indian contingent in Birmingham, UK. 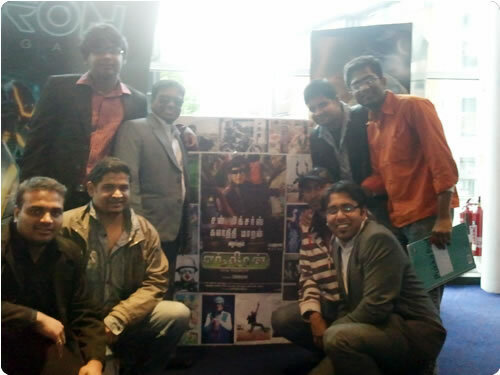 Rajini fever had gripped the city and the week end shows were house full. 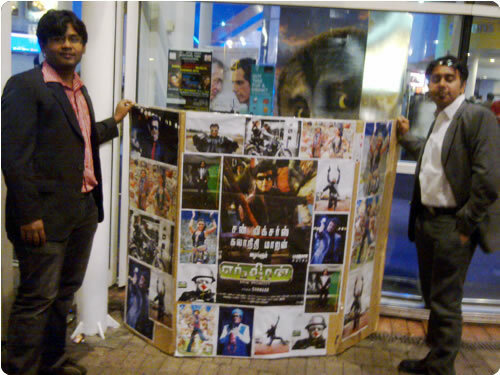 The movie was released in a record 27 screens across UK in Tamil which is more than what some of the Hollywood movies have managed recently. 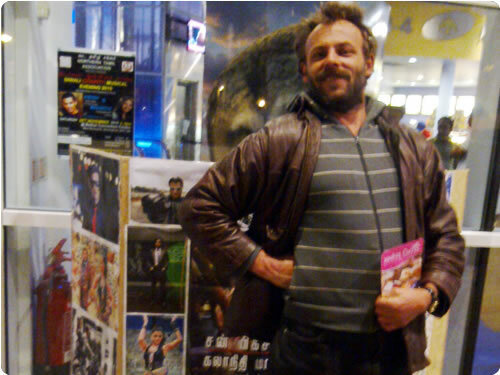 However we fans were disappointed to find there weren’t any promotional posters at the theatre for our superstar. This was the motivation behind us to make a collage of posters to be displayed at the theatre but was met with opposition. This sowed the seeds for what happened to be an exciting phase before Endhiran release on Thursday. I went to the theatre seeking permission but copyright issues and lack of space were cited as reasons for rejecting the request. I explained the fan following of our hero, his demigod stature and the joy it would bring to the fans here but it didn’t work. Manager was adamant and I was left with just one way of achieving it, through ‘singa pathai’, in our thalaivar’s style. Finally out of frustration, I asked the manager what if I managed to get permission from the distributors of the movie for which he replied I also needed to get through the theatre authorities at London. He wished me luck before I left but felt it was impossible as there were only few hours left before the release. I also didn’t know anyone at Ayngaran at the time and was just hopeful of pulling it off. I returned home, searched for the contact details, contacted Ayngaran and explained the situation here. Mr. Charles at Ayngaran asked me to send a mail and said he would do the needful within fifteen minutes. He did keep up his word and we could now get the posters to the theatre. Now having got the permission, we decided to put in extra efforts to make the collage even bigger. In the mean time, I went to the theatre and you know why just to show off anything is possible for a super star fan. We got more posters printed out and got to the theatre in time. Response was unbelievable and it was almost equal to Chennai experience. Whistles, screams, slogans and thunderous applause was seen through out the movie. Rajini is a phenomenon and the movie was an experience. Expectations were satisfied and that in itself is an achievement. There was a moviegoer from Czech Republic in the theatre and was awestruck by our celebrations. He joined us in chanting slogans of Superstar and wanted a photograph with the poster. Such is the attraction of our superstar. He is a robotic magnet and has managed to attract all our hearts. The magnet is the most powerful in the world and nothing can ever come in between the connection. I can go on to give a full review here but would probably do that in another column.